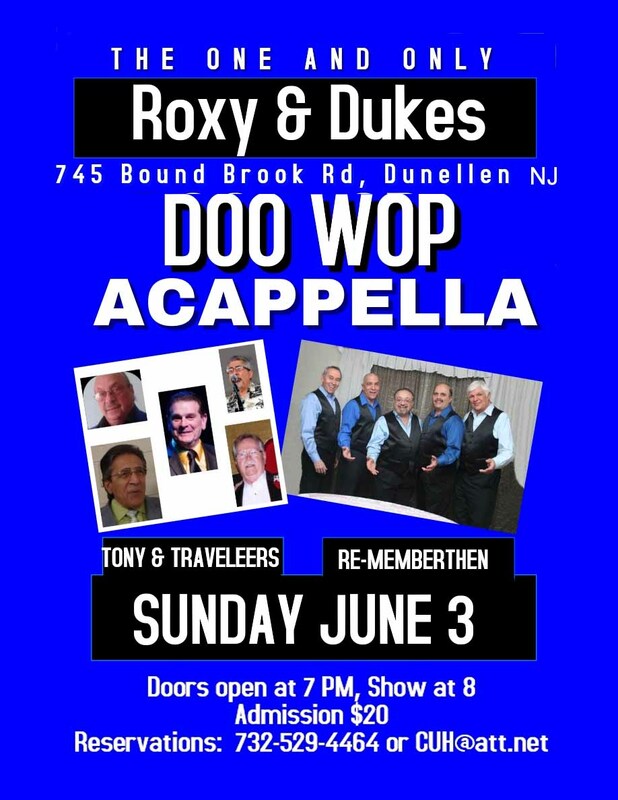 We are back at Roxy & Dukes on Sunday, June 3, with two great doo wop acappella groups — Tony & the Traveleers featuring Tony Russo and Re-MemberThen. Tony & the Traveleers are a new group on the scene with some familiar faces. Re-MemberThen recently taped an appearance for Part 2 of the PBS Doo Wop Generations TV special which will be aired soon. Both groups are loaded with talent. Looks like another fabulous time. Roxy & Dukes is located at 745 Bound Brook Rd, Dunellen NJ. Doors open at 7 PM, show at 8. Food and drink available for purchase. Free parking. Admission only $20 at the door. Email us at CUH@att.net for reservations.